Welcome to The Italian Gardener and the World of Italian Vegetables! 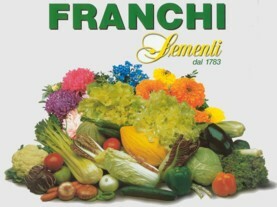 For the best seed available with guaranteed germination and purity, buy Franchi Sementi seed from The Italian Gardener. Order on-line or for secure payment options and regular or express delivery by Australian Post. Email me on info@theitaliangardener.com.au or call on 0407 833 930. The Italian Gardener sells vegetable and herb seed from Franchi Sementi SPA, one of the largest seed producers in Italy, and a family owned business since 1783. Italians are very particular about their vegetables. For more than 230 years, Franchi have won the support of gardeners in Italy and around the world by offering a range of heirloom varieties, selected for their taste rather than “supermarket” characteristics of transportability, long storage and uniformity. Franchi vegetables deliver on quality and flavour. Maggie Beer says that The Italian Gardener provides a direct link to Italy for her vegetable garden. "Not only do they have all the specialist herbs and vegetables I've come home hankering for after trips to Italy, but when I plant their seeds in my garden in the Barossa Valley, the result is exactly what I remember seeing in markets in Tuscany." My preferred method of payment is by EFT (Electronic Funds Transfer) where you ask your bank to transfer funds from your account to mine. Very safe and is at no cost to you or me. Chose EFT at the checkout and you will receive an email with my account details. Magnum, a new line of larger seed packets have been introduced for some seed varieties and are excellent value for small-scale growers. These packets contain about three times the amount of seed for twice the cost of normal packets. The choice is quite limited at the moment, but if you would like me to include other Magnum varieties, or for seed in bulk, please email me and I will see what I can do. Click here for details. I do not sell seed at full price if it has less than 12 months before the "use by" date. See the SPECIALS category for this seed and other special deals.